SINCE Abraham first adopted monotheism and smashed his father’s idols, the Middle East has seen more than its fair share of cultural vandalism. The prophet Samson, an antecedent of the modern suicide bomber, brought down a pagan temple full of Philistines. Iconoclasts destroyed holy Byzantine images. The followers of Muhammad ibn Abd al-Wahhab spilled out of the Arabian peninsula at the start of the nineteenth century and pillaged Iraq’s Shia shrines at Najaf and Karbala. Venerating burial sites, they declared, encouraged Muslims to worship men not God, and were thus places of shirk, or polytheism. When in the 1920s they took over the holy cities of Mecca and Medina, they destroyed the graves of Muhammad’s companions, wives and family. His own grave was only just spared. Since the Arab spring of 2011 gave way to chaos and war, the doctrine has spread. Abu Qatada, a radical Islamist deported by Britain to Jordan in 2013, has penned a 44-page fatwa pronouncing that mosques built over graves should be “torched”. 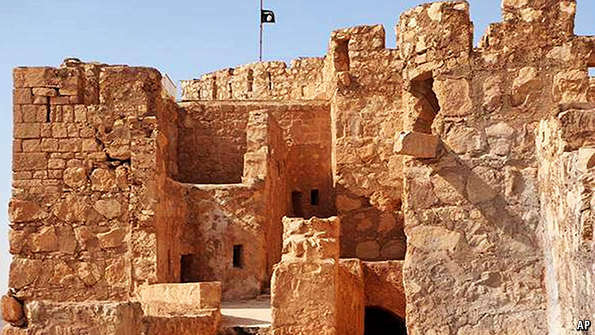 Hundreds of landmarks, from Libya’s Tripoli to Tikrit in Iraq, have since lost their shrines. Jihadists have attacked tourists at pagan monuments, targeting Tunis’s Bardo Museum with its unparalleled collection of Roman mosaics in March this year (and earlier, Luxor in 1997). On June 10th a suicide-bomber struck again in Luxor, but killed no one. Islamic State’s vandals invoke Abraham’s name when sledgehammering lamassus, winged bulls with human heads, or shooting at the Gorgon heads that graced the palaces of Assyrian tyrants who thought they were God. The scale is unprecedented. Four of Syria’s six world heritage sites lie in ruins. In May IS swept into control of a fifth—Palmyra, an ancient city famed for its thousand columns. So far, IS does not seem to have harmed the site, though it is early days. But archaeologists fear for it, and for Petra’s sculpture-decked caves, which are close to another hotbed of IS support, the Jordanian city of Maan. Along the Libyan coast, jihadists are in shooting range of the world’s best preserved Roman cities of Cyrene, Leptis Magna and Sabratha. The justification for all this has scholars stumped. Muhammad ended many ancient rituals at the Kaaba in Mecca, but continued to let worshippers perambulate around the granite cube. His companions, on whom IS claims to model itself, spared the pyramids. Ibn Jubayr, a medieval travel writer, so marvelled at the Nile valley’s temples that “spending a lifetime wondering at their adornment, decoration and beauty would be too short”. Ibn Abd al-Wahhab himself passed Ur’s ziggurat by. Iraqi archaeologists offer more mercenary explanations. By advertising their attacks on supply, IS hopes to increase demand. One dealer says that Israel’s authorities have approved his purchase of ancient Hebrew inscriptions whatever their provenance, so fearful are they of losing the antiquities for ever. 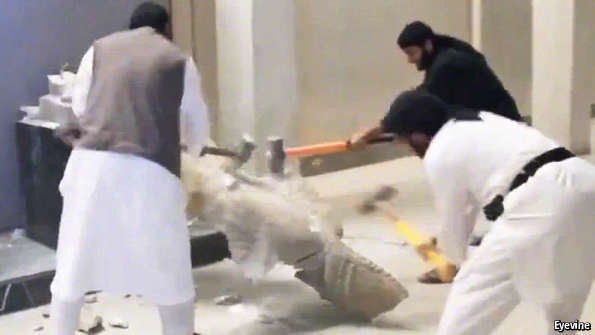 Tellingly, the jihadists ransacking Mosul’s museum with chainsaws earlier this year did not show the destruction of its most precious artefacts, says an archaeologist from Mosul—because they had already been spirited abroad. While mining the best sites with earth-diggers themselves, they leave petty smugglers to explore elsewhere, piously taking 20% of their earnings as khums, an Islamic tax. The contents of the museum in Raqqa, IS’s capital in Syria, were carted off by the box-load. So great is the racketeering, says one Iraqi official, that antiquities trafficking is now a prime source of IS revenue. And as Western air strikes bomb the oil installations IS has captured, the need for antiquities-dollars will only rise. IS is not alone. In an ancient region where state authority has in many places collapsed, armed groups, from the rebel Free Syrian Army to criminal gangs, maintain warehouses stuffed with antiquities, says René Teijgeler, who runs a Dutch-funded NGO, Heritage for Peace, operating on the Turkish side of the border with Syria. Poverty also boosts supply. “A lot of this is subsistence looting,” says James Ratcliffe of the Art Loss Register, a London-based monitor. Gangs have been at work around the step pyramid of Zoser, Egypt’s oldest. A collection of 7,700 ancient gold coins, jewellery and statuettes disappeared from Libya’s main commercial bank in Benghazi. Art dealers in London insist that, with few exceptions, the loot has yet to surface in Western auction houses, leading some to question the extent of the losses. But Christopher Marinello of the London-based Art Recovery Group was shown a Roman vase from Syria he valued at tens of thousands of pounds. Other dealers report finding Mesopotamian antiquities on eBay, an internet auction site. Deborah Lehr of an American association, the Antiquities Coalition, estimates that $3 billion worth of Egyptian antiquities have been lost since the fall of President Hosni Mubarak in 2011. Between 2012 and the IS advances of 2013, America’s International Trade Commission reported that the import of declared antiquities from Iraq and Syria soared by 672% and 133% respectively. A chorus of local and foreign experts have demanded military action to save the precious sites. 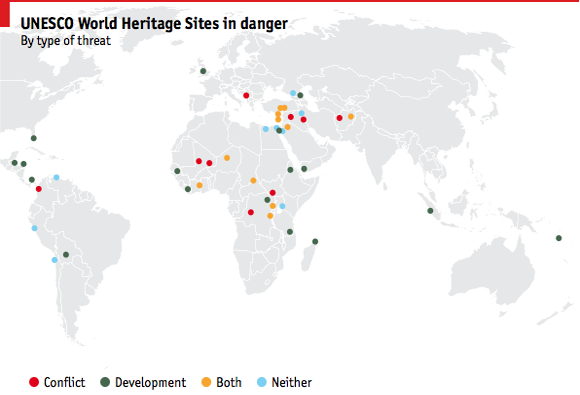 UNESCO’s boss, Irina Bokova, terms the destruction of heritage a war crime and calls for the creation of “protected cultural zones”. With an eye on Libya, Italy’s foreign minister, Paolo Gentiloni, wants to form a “blue helmets of culture” force that could parachute in when conflict or natural disaster threatens. Others call for America to extend the “responsibility to protect” not just to human victims of genocide, but to inanimate objects of “cultural genocide”. The Hague Convention of 1954 provides legal cover of sorts. It requires signatories “if necessary, [to] put a stop to any form of theft, pillage or misappropriation of, and any acts of vandalism directed against, cultural property”. Short of ways to restrict supply, international agencies have tried instead to curb demand. In February the UN Security Council passed Resolution 2199 banning the sale of antiquities from Syria as well as Iraq. Law enforcers have had some success recovering artefacts, returning much of what was stolen from the Mallawi museum in Minya, a city in upper Egypt, in 2013. But more can be done to tighten controls. Turkey’s border remains wide open. And for 60 years Britain, a hub of the global art market, has declined to ratify the Hague Convention. It has only three policemen assigned to tracking illegal sales, says Robert Jenrick, a former director of Christie’s, now a Tory MP. No one is sure how charges for heritage crimes might be brought. Hoping to prick consciences, UNESCO has staged a host of conferences and helped publish red-lists of endangered heritage aimed at “awareness building”. The Assad regime and Iraq’s government have jumped on the bandwagon, trying to drum up support in their struggle between civilisation and the barbarians, while locating missile batteries atop the vantage point of hills with ancient shrines. Iraq has debated the issue in parliament, and is putting its antiquities back on display for the first time since America ousted Saddam Hussein. “Our response to IS’s destruction of museums is to open museums,” says Iraq’s tourism and antiquities minister. But all the publicity may only encourage IS to grab more headlines. But the bravest measures are those of the locals themselves. In Mosul townsfolk rushed to the defence of a famous leaning medieval minaret when IS tried to destroy it. Mr Teijgeler of Heritage for Peace has re-employed 150 former antiquities officials who worked in the two-thirds of Syria that is now rebel-held. Some have taken to three-dimensional imaging to provide models for the time when the region begins to rebuild itself, while burying what remains. Others have rescued antiquities, including the mosaics ripped from a church wall in Idlib, in north-western Syria. And a few try to persuade. Mr Teijgeler is designing a training course for Syrian jihadists on the merits of preserving the past. Perhaps minds will change. IS recently published a travel brochure celebrating what ancient sites in Mosul still remain.